I don’t want to take your attention away from my previous blog, and even the one before that, but I’ve managed to get this great photo of “The Library” at Petra from my son. For those of you who have read “Mrs. Job,” or its later update “Figs & Pomegranates & Special Cheeses,” I hope it’s of interest to see this Petra landmark. Remember that Petra is basically Edom where the biblical Book of Job is located. I’d love to see you there on Saturday if you live nearby. Besides the items of direct concern to me, there will be much of beauty and interest to see, ponder, and enjoy. The theme of the current gallery display is “Back Stories.” The story of the cover of “Figs & Pomegranates & Special Cheeses” will include the original art work by Marilyn Brown along with a step by step display of the graphic art enhancement by Jenny Janson of Janson Graphics. Copies of “Figs & Pomegranates & Special Cheeses” (and its predecessor “Mrs. Job.”) will be available for sale. There will also be on display a photo print by Doug Affinito with its backstory. Doug and Lisa and I will be there for the opening, arriving sometime around 7:15 or 7:30 p.m. Jenny will also be there, and, I hope, Marilyn. The location is given on the attached brochure designed by Jenny. After All I’ve been through with the title! Remember? It was originally published as “Mrs. Job.” It wasn’t long, though, before it came through loud and clear that people were pronouncing “Job” as if it referred to paid employment. And besides, I left the Ph.D. after my name, so people got scared off thinking it was some heavy academic tome. I realized the latter point when I gave a copy to Lisa’s neighbor in Williamsburg. She had to read it, of course, because it was a gift she had to acknowledge. And then she was surprised, discovering that it was a good read. “I was afraid to read it,” she said, “because I thought I wouldn’t understand it.” Oh my! In spite of all that, though, a traditional publisher wanted to publish it. So back at the beginning of 2013 when Doug and I were heading off for a month’s Asia/Pacific cruise they had me terminate my contract with iUniverse, planning to come up with a new name and cover while I was away. In the meantime they provided an editor to work with me, and a copy editor, so Mrs. Job was thoroughly vetted. It took a long time for the copy editor to make his way through it. I had just made my final response to his latest effort when I received a notice in mid-summer, 2013, that they had lost their funding and would not be publishing “Mrs. Job” or whoever she was to become. So, Job’s wife was essentially homeless (i.e., unpublished, except for leftover copies) from January, 2013 ‘til November 2014. (Almost two years.) That’s a pretty long time for a lady to be without a home. At any rate, after much discussion with lots of people, I decided to publish it as “Figs & Pomegranates & Special Cheeses” taken, as you know, from a quote on p. 50. By the time she hit the presses she had been so thoroughly edited that I rejected the first draft when I found a typo on page 115 and re-did it. Even now, there is a “.com” missing on the ESBN page. Just to prove no one or book is perfect. To tell the truth, Jollie, with the really great reviews “Mts. Job” had received before and “Figs & Pomegranates & Special Cheeses” has received now, I did hope the book might hit the tipping point into great sales. As you point out, it hasn’t happened. So I won’t throttle you. It’s not your fault. I did decide to take the advice of a blogger friend and stop sending the message out to the universe that I “need” it to succeed. Sometimes I feel like really retiring and just hanging out with some good books, but instead now I’m focusing on “My Father’s House” and letting Job’s wife find her own way in life. Well, not quite. Today I listed her on Goodreads. (I just checked. I guess this link won’t take you there until the Goodreads folks have judged it worthy on Monday.) It would be nice if people were to go there and write reviews. But … nope. Stop that,Mona. I’ll focus on things like getting to choir on time tomorrow morning, and sitting for a while by the fire with one of the many books I have in the works. Message to the universe: I don’t really “need” for “Figs & Pomegranates & Special Cheeses “ to reach the tipping point, so feel free to come by and tip it. That’s it, Jollie. I love you and miss you, and cherish all the years of friendship. I don’t have any great wisdom to impart, or challenges to offer, or prizes to give. I just want to check in so you won’t forget me out there in the blogosphere. The heading? 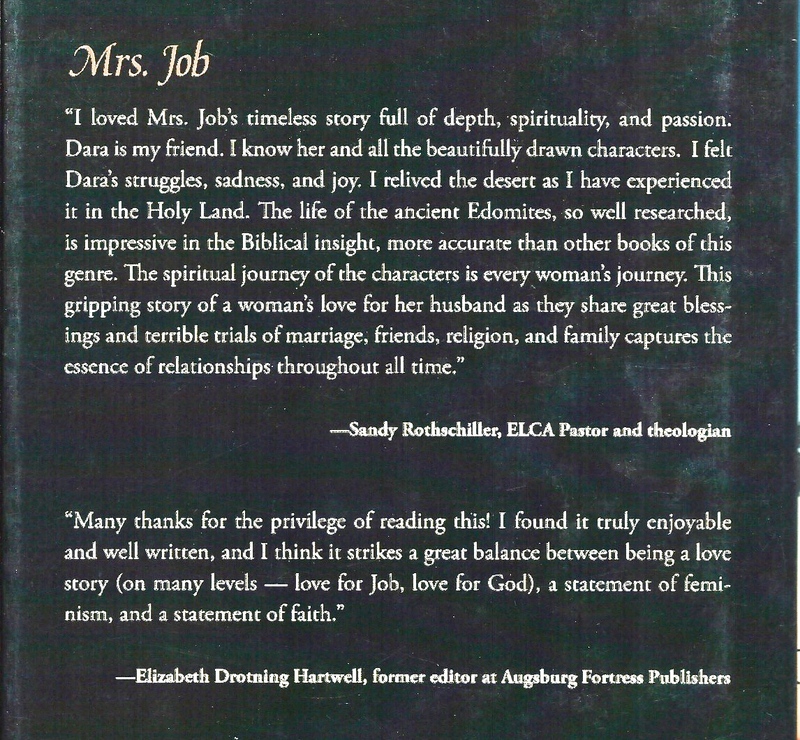 Well, as I said recently, I’m focusing this month on finding ways to get Mrs. Job published and marketed. I’m checking out self-publishing — again (now that my contract with iUniverse is broken) — and the possibilities of aid with marketing if I choose that route. Obviously I haven’t been very successful on my own. In consultation with my MFA sister, I’ve decided on the new working title: Pomegranates and Special Cheeses. Perhaps with a colon addition: A Biblical Love Story. If you’ve read Mrs. Job you may recognize this as a description of their young love, mentioned a few times in the text. It goes without saying that the book needs a different cover — more appealing if one should see it sitting on a bookstore shelf. In the meantime, it’s taking a lot of time to learn the music (to be done a cappella) for the nun’s chorus in “The Sound of Music.” Mark Abelsen, the director, is, I’m happy to say, a stickler for perfection. Scary, but should produce a really great result. As for Sister Margaretta, I think I’ve got her part down, except when I panic on stage. And then there’s winter in Minnesota, though I’m happy to say we seem to be past the extreme deep freeze that had my fingers numb in no time when I went outside. The part that bugs me most, perhaps, is that I can’t get to “My Father’s House.” I’ve thought about it, and I think the word really is “can’t.” I just can’t postpone the work on “The Sound of Music,” and I’ve committed myself to working this month on Mrs. Job — oops! Pomegranates and Special Cheeses. I would be very happy to receive comments — on the potential title, or possible marketers, or to share cold weather stories, or anything else I’ve said here — or just to let me know you’re still willing to bother with me in spite of my frequent absences. I have received e-mail responses to my latest blog, encouraging me to keep pushing for Mrs. Job’s publication, making really nice comments about the book. Such things are good to hear.